When four classmates from a small Massachusetts college move to New York to make their way, they're broke, adrift, and buoyed only by their friendship and ambition. There is kind, handsome Willem, an aspiring actor; JB, a quick-witted, sometimes cruel Brooklyn-born painter seeking entry to the art world; Malcolm, a frustrated architect at a prominent firm; and withdrawn, brilliant, enigmatic Jude, who serves as their center of gravity. Perhaps this book would have been better served as a read, rather than a listen. 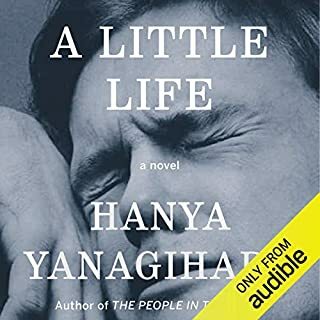 "A Little Life" is a long (very long) tale of what happens after a traumatic experience, even after a "rescue" from that trauma. But the trauma is so great that it is extremely difficult to listen to. I found myself taking many breaks in order to do it, and it didn't help that the narrator gave the protagonist an incredibly whiny voice that I don't feel he deserved. Still, the book broke my heart. Recommend it at 1.5x speed. Today should be one of the worst days of 17-year-old Hadley Sullivan's life. She's stuck at JFK, late to her father's second wedding, which is taking place in London and involves a soon to be step-mother that Hadley's never even met. Then she meets the perfect boy in the airport's cramped waiting area. His name is Oliver, he's British, and he's in seat 18C. Hadley's in 18A. Unfortunately, this wasn't quite what I wanted. Smith writes characters that moan and whine in the grand tradition of YA fiction, but rarely develop more than the story asks for. And when that story is "girl goes to London and falls in love with boy on the way-- also, they both have daddy issues"-- well. 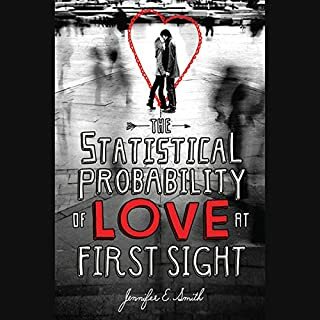 Would you recommend The Statistical Probability of Love at First Sight to your friends? Why or why not? I'd recommend other young adult fiction novels to my friends. This one had a lovely name, but relied too much on tired tropes and brick jokes. Would you be willing to try another one of Casey Holloway’s performances? I'm sure Holloway is a fine actress, but this text did her no justice. Although her British accent could use some work. Could you see The Statistical Probability of Love at First Sight being made into a movie or a TV series? Who should the stars be? Everyone wants to escape their boring, stagnant lives full of inertia and regret. But so few people actually have the bravery to run - run away from everything and selflessly seek out personal fulfillment on the other side of the world where they don’t understand anything and won’t be expected to. The world is full of cowards. Tim Anderson was pushing 30 and working a string of dead-end jobs when he made the spontaneous decision to pack his bags and move to Japan. If you could sum up Tune In Tokyo in three words, what would they be? Did MacLeod Andrews do a good job differentiating all the characters? How? MacLeod Andrews was mostly good, except for when he tried to speak Japanese and speak in a Japanese accent. Then it was sometimes offensive. Sometimes I would laugh out loud, sometimes I would chuckle, but overall I listened in stoic silence trying to figure out when the next time I would laugh was. In general, I don't laugh a whole lot (ha ha). This particular read though was not bad. It was an interesting, if seemingly dated (no talk of cell phones here), jaunt through Japan. Though many observations were a bit stereotypical (Anderson's description of Japanese people's formalities, for instance), and though Andrews' reading was sometimes more than just stereotypical (intentional changing of r's to l's, for instance), it was overall vaguely amusing. 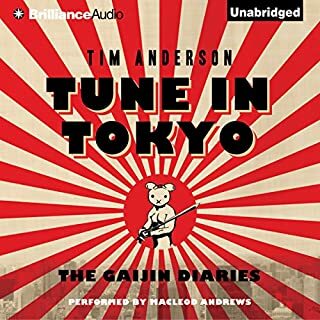 I enjoyed greatly that the story was a bunch of vignettes in Anderson's life, but I would have liked to see greater insights into Japanese culture. Overall: not bad. But not great. What did you like best about Fangirl? What did you like least? While I enjoyed some of the wordplay, as well as the all-too-rare college setting (why are so many YA novels set in high school? well, I guess that makes sense, but nevertheless), the protagonist is just completely spineless. I actually listened to this while running, and it actually made me run faster because I was just so angry at Cather-- she actively avoids anything new, and resents her sister for meeting new people and having fun in college. Granted, this might have been me projecting at my own memories of being an overly introverted person back in college, but that doesn't change the fact that Cather just cannot stand alone as a protagonist. There are a number of redeeming factors, however; her roommate, Reagan, is probably the only reason I continued reading the book, and her sister is just fun to read in general. However, the love interest is a bit of a Manic Pixie Dream Girl archetype who cannot stand as a character without Cather, and is wholly uninteresting with manufactured hamartiae. Finally, the book ended right as the story really got rolling, with the first half of the story consisting of mainly Cather whining. In fact, it was so abrupt that it almost didn't make sense-- and right as Cather was starting to grow on me, too. Overall, I cannot wholly recommend this book. It is cute. I will grant you that. But if protagonists who rival Hamlet in their wishy-washiness bother you, this book is not for you. It's really too bad. Would you be willing to try another book from Rainbow Rowell? Why or why not? I have heard good things about Eleanor and Park-- might try that one. But this one was meh. Have you listened to any of Rebecca Lowman and Maxwell Caulfield ’s other performances before? How does this one compare? I haven't listened to Lowman or Caulfield before, but they did a really great job considering the circumstances. Lowman reads an especially snarky Reagan. 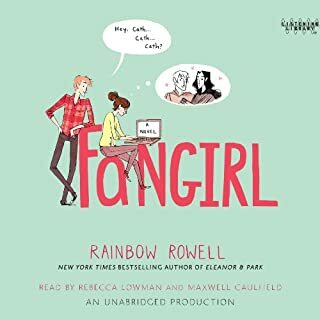 Do you think Fangirl needs a follow-up book? Why or why not? Fangirl's ending was quite abrupt, but it was creative in its used of somewhat mixed media (i.e. excerpts of the fanfic Cather reads all the time). That might be nice to see.